Are you going to update the recommended fans any time soon? I'm eager to see if you guys rank the DFS122512L-PWM near the top. Great, my Ninja comes with the slip stream 1200rpm fan, it does sound very quite. Is the rpm rating comparable to the fan tests using the old method? I want to see how the slip streams compared to S-flex at the same noise level. Thanks. Edit: Never mind, just saw you have mentioned that the rpm rating has come down. Will wait you update the data of S-flex fan. Thanks. One thing I'd like to see noted - the scythe fans represent great value. At least in NA, they are less expensive than most other premium fans - barely more than the generics. Anyone have any tips on modding the corners of the DFS122512L-PWM so it can be mounted on a Xigmatech S-1283? Just take a hack saw to the corners. Plastic cuts easy. I've done this in the past by making two cuts at each corner, each cut just below the lip... then taking a sturdy pair of pliers and squeezing the unwanted portion of the corner. It takes some pressure, then the corner get's crushed, leaving clean edges as a result of the cuts. If you can visualize what I'm saying, try it maybe with an old fan. If not, don't do it, and don't blame me! Or use the answer to all of life's problems. zip ties! I use that fan too and here's how i mounted it to my ultra 120. I'm trying to visualize it, and admit I'm not quite getting it. I'm looking to remove the portion of the corner that ties the holes on the front to the back, preventing the use of the type of rubber mounts that come with the Xigmatech sink, which need to be pulled through the corner hole closest to the heat sink. I'll have to poke around and see if I have any closed fans to experiment on. You did not include the S-Flex fans in this shoot-out. Would you like to comment on the reasons for this? According to Scythe specifications, they are quieter, RPM for RPM, as the winning Slipstream models - 20.1dB vs 24dB for the 1200 rpm variants. You did not include the S-Flex fans in this shoot-out. Would you like to comment on the reasons for this? The ambient noise level was slightly higher when we re-tested the S-Flex series, making it difficult to compare them directly with any degree of accuracy. Perhaps you would like to make a donation for the acoustic chamber? The Ultra Kaze makes no sense in a no restriction environment. Their real strength is their high static pressure, making them push a lot more air under high impedance. It has been proved though that they have no competition when placed on a watercooling radiator (from Martin on XS forums, so using proper testing methods), where their performance/noise ratio is way above the 25mm thick fans. The conclusion of this SPCR article is not surprising: it's just the confirmation of what has been known for a while, the Slipstreams are the kings of case fans / low restriction as of now - but that's only a specific use condition. I can vouch also for the 800rpm slipstream: it's really an excellent product, and a silver bullet for building low noise PCs. On the other hand, the 1000 and 2000 rpm Ultra Kazes, when on a fan controller (or a motherboard plug that supports speed setting) are now the kings for watercooling and other high impedance radiators. The 1000rpm model becomes really quiet at 800rpm and still pushes a lot of air. Post subject: Power first silence second! When these "Slipstream" models first hit the market, they looked very promising and I snatched up 4 "SH - 1900RPM" models. I also picked up a 4 way controller that could vary the output to the fans from 7V-12V. Since I started using them, I've almost always left them at 7V and couldn't be happier! I only crank them up for serious CFM durning heavy overclocking/benching sessions where I can run over 4.0GHz on air! (my team at OCForums just won the 2008 Winter Warz! ) While I almost picked up the 1600RPM versions instead thinking the 1900RPM models would be overkill, after seeing your article, I know I made the right choice! But the best part is not at 12V...it's when they're almost silent at 7V. These fans are awesome! My last Ninja did come with a Slip-Stream 1200, so I can vouch for it's qualities. What I find interesting and difficult to understand.....the large differences between the Slip-Stream 1200 and 1600 models. I've never heard the 1600, so I can only go by your testing. I'm particularly at a loss to figure the almost 300 rpm difference at low voltages, and the much lower start-up voltage difference between the two. It almost seems these two fans are completely different models......that look exactly the same on the outside. I wonder could they be made by completely different companies? Any guesses exactly who is making fans for Scythe? Next question..... life-span differences between the Slip-Stream and the S-Flex. All my projects seem to end up with horizontal-mounted fans. For that reason the S-Flex should be the better choice....on paper anyway. But I've never heard anything specifically bad about mounting a Slip-Stream horizontal. My Slip-Stream 1200 is mounted horizontal.....without any issues so far. Nice set of tests.....looks like the Slip-Stream 1200 should become your "reference" fan. wont the slipstreams just mount on the xigmatek with the rubber mounts they provide? Handy-dandy Fan Corner Cutting Guide that's been stickied in the "Fans" forums for a few years now. Illustrated with color pictures! Thanks RH, you're the best! One question: How many fans did you test per fan-type? The number of samples is listed in the green portion of the data box for each model. The number varied, from one for a few to 6 for some. When there were many samples, not all were checked -- after you've checked a few and they all sound the same, we accept that's the norm. If you find one that's noisier, it's the exception, and we think it's most often shipping-related damage. No one else probably even notices because no one else tests at as wide a range of speeds as we do under such an acoustic microscope. Variances were noted -- in the data box and discussed in the text. Thanks, must have overlooked that part of the box. Your observation is quite surprising to me. I always assumed the differences between individual fans would be bigger, especially when one looks at the quite big standard deviations the manufacturers quote for example for fan speed. Great test, although the scientist in me always wants to do statistical analysis on almost everything. This is not to say there are NO differences at all, all we're saying is that there weren't any differences that were significant acoustically. Fan speed deviation really refers to the volts-to-rpm relationship. Some might require higher voltage to get to 1000rpm or maybe less voltage -- but does this matter in our context? No, not really. We assume, I think correctly, that most people studying these articles in detail will have and will want to have fan controllers... and they're mostly tuning the speed by ear, with an eye on the temp monitor. The relationship between rpm (or CFM) and noise is what we're more atuned to in our tests. I keep yearning for meaningful stat. analysis too but I'd have to organize an enterprise like CSA or UL to pull that off successfully... no thanks! I would like to see more consideration given to fluid bearings, such as found in the Noctua, Panaflo, Scythe, and Evercool. One data point often missing from the fan comparisons is Static Head Pressure. I've requested this information from Scythe and Evercool, as neither publishes their data. This is helpful when researching fans suitable for high impedance loads. When you come right down to it, all we can say about the bearings is whatever the company tells us about them. We do discuss bearings at length in the Anatomy of the Silent Fan article linked in the review. The only way to know more is to do long term statistical analysis with large numbers of samples under a variety of controlled conditions -- something few enterprises have the resources or interest to pull off. As for pressure, this is another very difficult thing to measure consistently. We have enough trouble with CFM without adding pressure to the mix. The simple rule of thumb is that given the same size (120x120x25) and number of blades, pressure is directly tied to rpm -- it doesn't vary much other than with rotational speed. I don't really know what happens with a higher number of blades. I do know that to make any significant increase in pressure, you need to increase the depth of the fan, which allows for each blade to be a bigger "scoop". Hence the 38mm depth of the Ultra Kaze fans. In future we may just add something like a high impedance heatsink up against each fan and repeat the airflow measurements -- this will give us some idea about pressure. Please remember this when it comes time for this year's annual performance evaluation/raise! a) even the best axial fans really aren't capable of producing much of a pressure rise. for that you need centrifugal (squirrel cage) fans. b) given a), the best approach is often to reduce the impedance/backpressure that the fan has to face (ie by prudent selection of heatsinks etc) in order to reduce the overall system impedance. [email protected]I don't really know what happens with a higher number of blades. in theory more blades = better pressure capability, but again see point a) above. The significance of that to me is that a L 800 is quieter than a nexus but doesn't keep up in the airflow dept. You need a M 1200 or H 1600 to give you the top airflow of a Nexus 120mm at 12v and either does so at about 1-2 dBA less noise! Only the M 1200 can also give you the lower dBAs to compete with the Nexus in a wider range below 20 dBA. I'd definitely like to see the Slipstream M 1200 RPM model be the new reference fan. Especially if that means we start seeing heatsinks tested at 28 and 24 dBA in addition to the already very quiet levels the old tests are done at. This would bring heat sink testing in line with the comparison charts on PSUs reviews where you color the dBA below 30 differently than above 30 dBA. Besides CPU heat sinks are usually central to the case so the noise is less of an issue compared to an intake or exhaust fan. Which doesn't give much of a range in dBA for testing heat sinks. Though it does at test lower CFM situations more thoroughly. The counter to that is easy though, just add 4v to the testing since the Slipstream M 1200 handles it well and add fanless testing if the HS can handle it and let us read between the lines. Last edited by dhanson865 on Fri May 09, 2008 11:59 am, edited 1 time in total. Interesting suggestion, will definitely be considered -- probably after the anechoic chamber & new audio test gear is implemented. I've been reading the site for years, but just recently ventured into the forums. Thanks for the link - I'm off to buy a hacksaw and do some damage. The Slipstreams will, but not the PWM version. The corners are closed so there is no way to pull the rubber mount through, nor anyplace for it to "get a grip" on the frame of the fan. That's why it would have to be cut first. 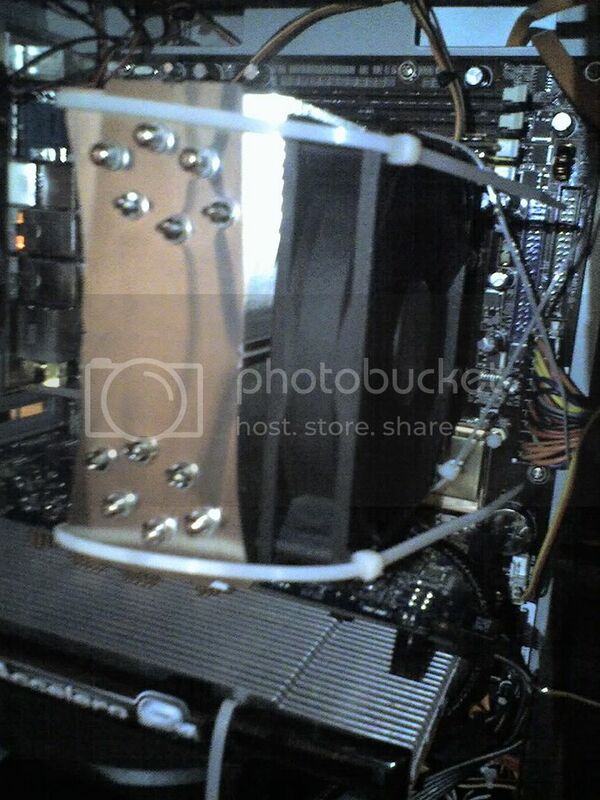 Click on the photos of the PWM fan and you can see the tube of plastic connecting the front and back holes in the frame. oh right, sorry my bad, didnt know you where referring to the pwm.